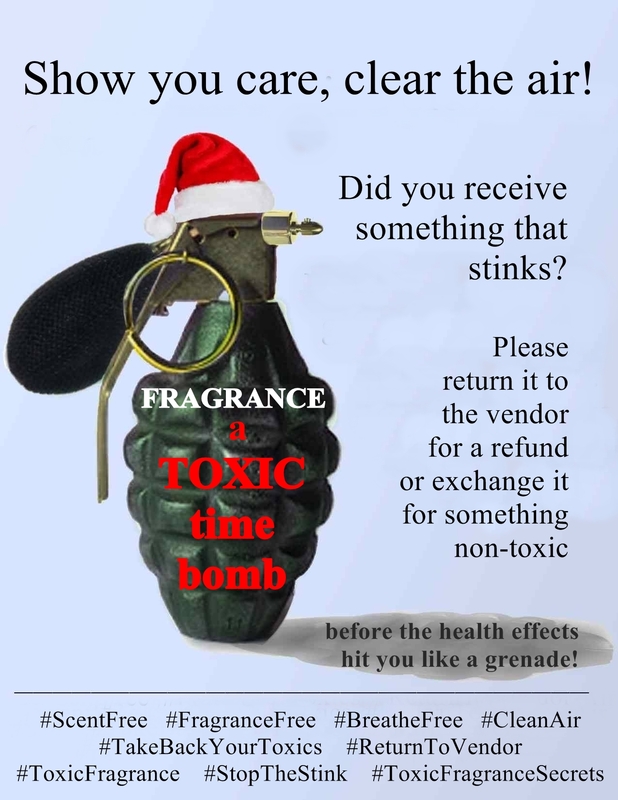 Return That Stinking Toxic Gift To Vendor! Ask for a refund, or exchange it for a non-toxic, scent-free item! It would be so great to get a movement together (yes, it’s really short notice for this year) to return all fragranced and otherwise stinking toxic “gifts” (that keep on giving adverse health effects) for refunds, or to exchange them for fragrance-free and healthy stuff. Who’s in to help spread the word? * Sometimes people like to donate their unwanted cosmetics to those “less fortunate”. Shelters are a popular destination. I am not one of those people who could do that to another person (no matter how needy they are or uneducatedly appreciative they would be, and no matter how useful or not wasteful I want to be) and I hope you won’t do it either. It not only subjects others who are already vulnerable to more health stressors, but when there are fragranced products in use at a shelter, it creates barriers to access for people who have immediate adverse effects from toxic exposures, so they could not enter, even when their lives are at risk from outside circumstances, because the exposures inside could cause just as much harm. This leaves somewhere between 3 and 30% of the population with no safe place to go when they are being assaulted, become homeless, or have otherwise fallen on hard times (like having their health and abilities disabled from toxic exposures). Please return the stinking stuff to vendors or take them to the household hazardous materials depot in your area. Almost all of them take personal care and cleaning products and most specifically mention perfumes and cologne in their listings. This entry was posted in Air Quality, Environmental Health, Fragrance and Cosmetics, Gifts and tagged #ReturnToVendor, barriers to access, bath products, candles, carcinogens, chronic pain, cosmetics, donate, exchange, Fragrance, fragrance chemicals, gift return, haz mat, hazardous air pollutants, refund, scented, shelters, STINK, toxic, toxic trespass, unregulated. Bookmark the permalink. Thanks for this. It is sad that Christmas is probably the most toxic time of year. I appreciated the effort my family and friends put in to making sure that I received no gifts with fragrances. However, I still reacted to the ink used for the lottery tickets and I’ve washed my new 100 percent cotton jammies 3 times including baking soda in the wash and vinegar in the rinse and still can’t wear them — I presume from the flame retardants. There has been progress in my circle of family and friends. Last year my family went fragrance free but friends of my parents still sent them gifts with fragrances — this year they did not. There is an ever widening circle of understanding. I really hope people get the message that it is not acceptable for manufacturers and vendors to pollute us for profit and leave us paying all the costs and suffering from chronic and or deadly health problems.